All Photos by Dave Green. 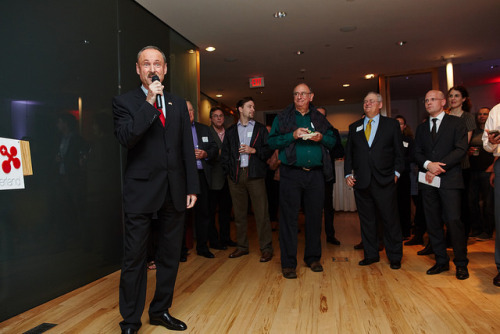 The weather wasn’t exactly our friend, when we made a call to celebrate 15 years of connecting the dots at swissnex Boston. 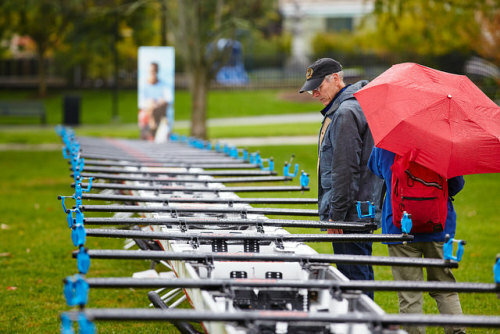 But despite disagreeable weather, many of you came to join us in the park in front of the Cambridge Public Library, where the famous Stämpfli Express (a 144 ft long rowing boat, naturally Swiss made) was on display for all to see. There was also a quiz on Basel-based innovations, a drawing contest, and Swiss chocolate (thank you, Lindt!). Oh– and never did we appreciate those umbrellas from Presence Switzerland more! “Holy Moly, that’s incredible!” “What? 24 People?” “Woooow” These are the exclamations we are used to hearing when stoppers-by encounter the Stämpfli Express. But hearing such words of wonder despite an ongoing downpour makes them even better. 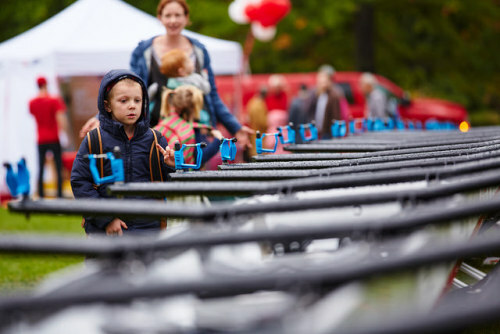 The high spirits of visitors were met with cheer by the staff of swissnex and Stämpfli Racing Boats (Melch Bürgin and Dave Gable, the two rustic rowers currently towing the stampfli around the country on a gigantic trailer). Maybe the unbroken high spirit had something to do with the released endorphins that come with assembling and disassembling a 850-pound sporting device day after day. How Basel Changed the world – did you know? “But how do you put it together?” “How fast can it go?” “How do you turn it?” “How did you get it here?” The questions were diverse., And the swissnex Boston team answered them all– except the technical ones, for which we of course deferred to Melch and Dave. Speaking of questions: Do you know what ozone smells like? In what century Paracelsus lived? And who discovered LSD? The answers to these seemingly random queries all relate in some way or another to the Canton of Basel Stadt, a partner of the event and of the Stampfli tour. The questions were part of a quiz they presented, and anyone with all the correct answers was entered to win a flight to Switzerland and a three-night stay in Basel..
For the evening portion of our 15 year anniversary celebration we swapped rain boots, coats and umbrellas for formal evening wear. A hot Bratwurst or Cervelat fresh from the grill (we love you, Starwurst!) 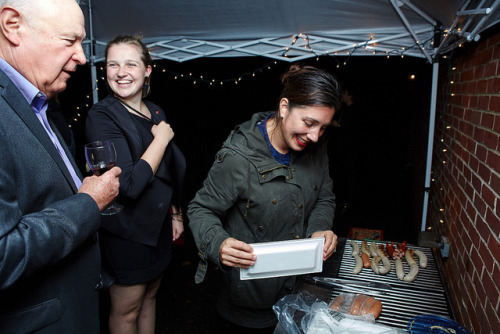 made for the perfect snack before more than 100 invited guests arrived for an evening of mingling, celebrating, listening to inspiring speeches, and consuming tasty Swiss-style food and drinks. 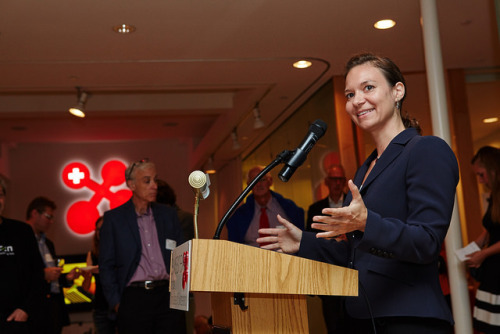 The panel of speakers to address the crowd was a represented the diversity of organizations swissnex Boston has been fostering relationships with over the past fifteen years. 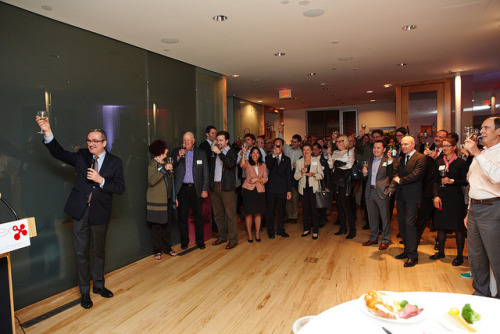 The opening words were delivered by Ambassador André Schaller from the Consulate General in New York, followed by speeches by Baschi Dürr, Executive Councillor of the Canton of Basel-Stadt and Nicole Sütterlin, assistant professor for German Literature at Harvard University—she is a Basel expat and frequent speaker and visitor of swissnex Boston events; next was Tim Rowe, Founder and CEO of the Cambridge Innovation Center (CIC) as well as Melchior Bürgin, a former Olympic rower and father of the Stämpfli Express, and last but not least Dr. Felix Moesner, CEO of swissnex Boston since 2012. We were honored to also count local politicians in our presentation of speakers: Massachusetts representative Keiko Orall conveyed greetings and a document signed by Governor Charlie Baker, and Cambridge Mayer Patrick T. Maher encouraged the audience to raise their glasses for a toast to swissnex Boston. The theme of our 15th anniversary was innovation. Entrepreneurial spirit is what drives us here at swissnex, and the collaboration with Swiss Startups a crucial part of our daily work. 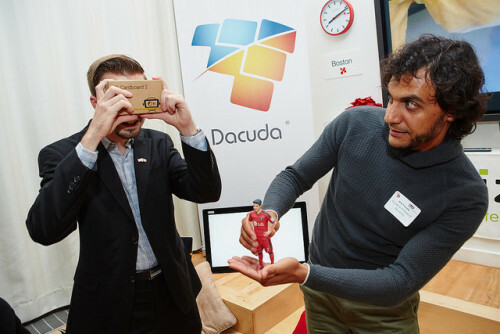 Dacuda, Flatev and Dizmo were present to give our audience a first-hand experience of the latest Swiss innovations. 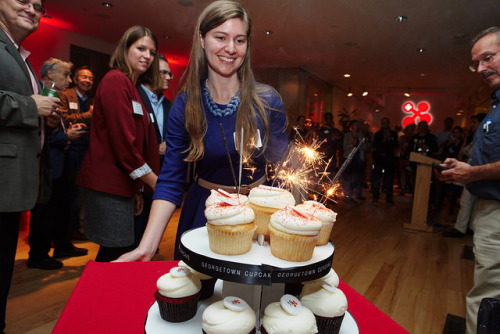 The cozy evening was rounded off with a raffle of prizes for Basel’s innovation quiz, a video message from 15 people we have worked with over the years and – since it was a birthday party – some candles decorating a tiered display of swissnex branded cupcakes. 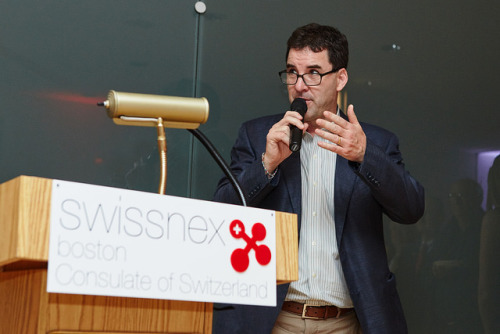 The swissnex Boston team would like to say thanks to all our guests, to the delegation from Basel-Stadt, and to our fantastic speakers of the evening. These are just some of the dots we’ve been connecting over the past decade and a half. And without dots, there would hardly be a swissnex. Find more pictures on our Flickr account; Photos of the Day Event and of the Evening Reception.